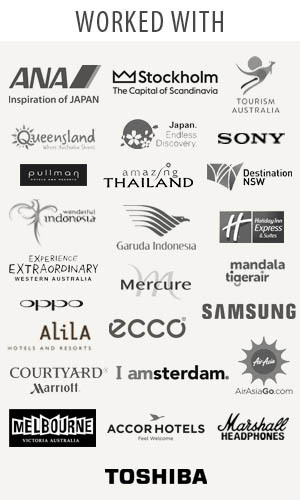 Traveljunkieindonesia.com – Hi travel junkies, here for you. 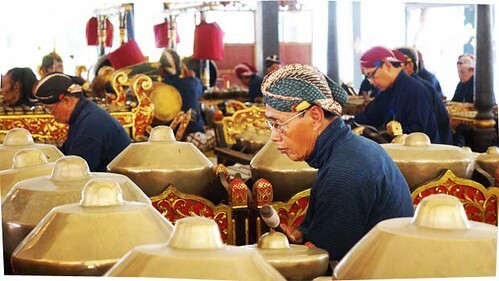 Spectacular gamelan-making in Bekonang village, Sukoharjo – Central Java. It is another magical, mysterious product of ancient Java. 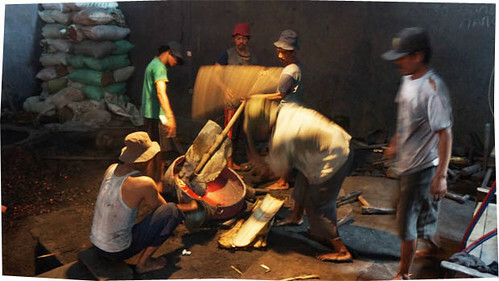 Bekonang, the locals pointed down the street, and as a full-time travel blogger and ethnomusicologist Puri Haryadi from the Indonesian Institute for the Arts (ISI) Surakarta approached a small, unassuming brick building we heard the sound of hammering. A group of men were crowded around a gong, pinned to the ground with a wooden lever, pounding it into shape with an oversized wooden mallet. The sound was deafening. The friendly workers, excited to have guests. 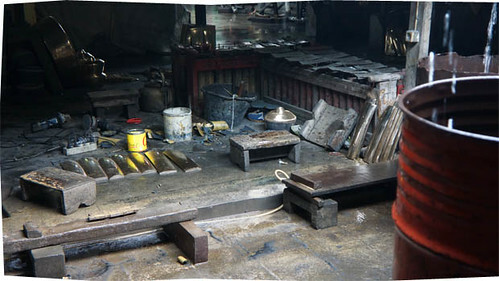 The boss showed us to a small room where a few finished gongs, made of copper and tin, were lined up, ready to be shipped. Orders came from Europe, Australia, Canada, Japan, UK, Scandinavia, South Africa, South America, Bali, etc, where they did not have the expertise to make the larger gongs. 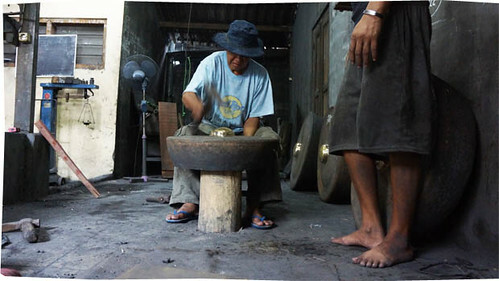 In a small, narrow alley next door, a boy polished a smaller gong with a buzzing rotary tool. The pounding stopped, and the workers proclaimed the gong finished. They moved inside to the smelter. A man squatted on the floor with a sack full of old speakers, motors and generators, a cheap source of “recycled” copper. He dumped the bag on the dirt floor and selected bundles of copper wiring to put on a scale. The boss, scratching some calculations on a dirty scrap of paper, made a mark on a dull, silvery hunk of metal. I wasn’t really sure if it was lead or tin or a mixture that was being added to the copper – the word “timah” in Indonesian means both! From the high price, however, we assumed it was tin. The boss told us that special customers requested that silver be added as well, to improve the sound. Piles of charcoal were everywhere. It was impossible to stay clean with the dirt, grime and dust. The workers, walking barefoot around the “pits”, stoked the fire. A pile of black ashes sprang to life, glowing red-hot. A length of rebar, heated in the fire, its tip glowing a dull red, was used to cut the morsel of tin into two pieces. 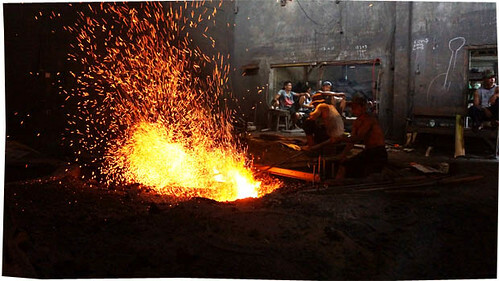 The scrap metal was put into a ceramic crucible, then placed in the glowing pit and covered with charcoal. The workers, walking cautiously with their bare feet, poked and prodded the fire as sparks blew in the air. The mold, a flat, round impression in the ground, was carefully swept clean in preparation for casting. The men gathered around, nervously anticipating the crucial operation of pouring the red-hot molten metal into the mold. 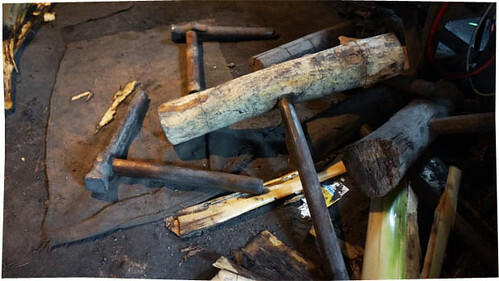 When the stoker deemed the mixture hot enough, the men, holding tongs protected by gloves improvised from banana-trunks, picked up the crucible and poured the fiery liquid into the mold. Impurities, floating on the surface, were scraped off with a metal bar. Rice husks were thrown over the cast to form a protective layer. They immediately turned black and started smoking. 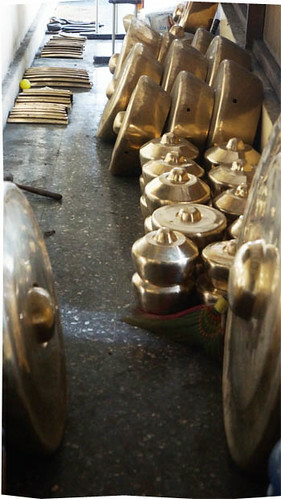 Get more information about Gamelan here. It was WONDERFUL!!! I have a magical spot in my eardrums reserved just for traditional musical ensemble. Doesn’t everyone? My friend and I had a lovely time. The atmosphere was great, the portions were good, prices were fine, and the sound was tasty. The next time we come here, I think we would just order gamelan complete to concert. 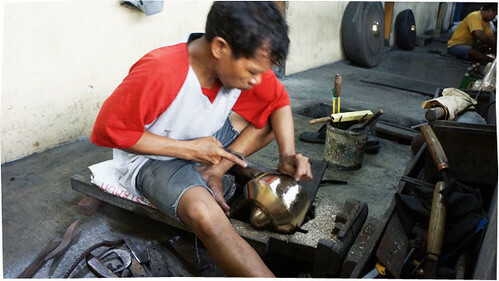 Can you give more info on getting to Bekonang and find this Gamelan maker?